It’s kinda neat that the game and translation are getting recognized in magazines all over the world. 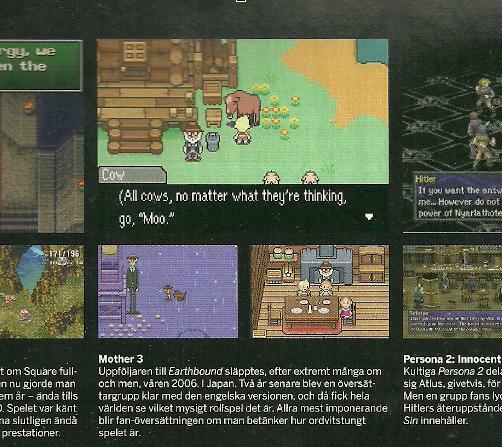 It looks like Seiken Densetsu 3/Secret of Mana 2 and Persona 2 are on the same page, too. I never really thought about it before, but that’s like three different gaming generations all sitting together. Neat-o. I’m glad you’re getting some good press for your hard work, Tomato. Hah! Cool. I think level is pretty big magazine (within swedish game magazines, that is), although I don’t really know much about magazines nowadays. Looks like Chrono Trigger to the left of it. That’s cause Chrono Trigger and Seiken Densetsu have similar graphic designs. This makes me wonder…It’s been so long since the English translation came out, and I remember many other languages were being worked on. Are any other language translations still being worked on? Or has it all died off…? A lot of them are on hold or taking it slowly (it IS a ton of work), there’s one or two that are starting to near completion though. Seiken Densetsu 3(secret of mana 2) is a very fun game that I love very much. I learned that on the wikipedia article for mother 3, on the fan translation part. You’re aware that you have your own Wikipedia article right? Yeah, I know, I just think it’s really weird since I’m not that notable/important and kind of wish it would get taken down, but oh well. From now on I will call Mato Clyde.